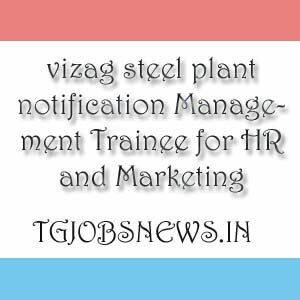 vizag steel plant recruitment has given the notification for the recruitment of Management Trainee for HR and Marketing. Candidates who are interested and willing for the vizag steel plant recruitment jobs can apply for the job after reading the particulars. And here, online application submission starts on 20/07/2019 and closes on 09/08/2019. Read the vizag steel plant jobs notification once or twice. If you are confirmed that you are eligible for the vizag steel plant notification then you can go to the direct website link Click Here. If you are unable to read the full notification then here it is a simple way. We have already given the details of the post. The details which we have given are very easy to understand. So go through it. The candidate should have the MBA / PG Degree / PG Diploma in HR and Marketing / Personnel Management & Industrial Relations or Labour Welfare or Social Work. 27 years is the maximum age limit. The candidates are selected on the basis of UGC – NET, June 2019 score and Personnel Interview. Rs. 500 for the Gen and OBC candidates. And there is no fee for all the remaining candidates. For this /management Trainee Posts the salary ranges from 20,600 to 46,500.